We are continuing to track a severe weather threat for Monday. Strong to severe thunderstorms may impact the region, with storms capable of producing damaging winds, large hail, heavy rain, and isolated tornadoes. The Storm Prediction Center has placed most of the region under a “Slight Risk” for severe weather. Severe weather will become possible Monday afternoon, mainly after 2pm. Prediction models indicate two “rounds” of storms. The first will come during the afternoon and evening hours. These storms will likely be scattered and possibly strong to severe. Large hail and damaging winds are the primary threats. 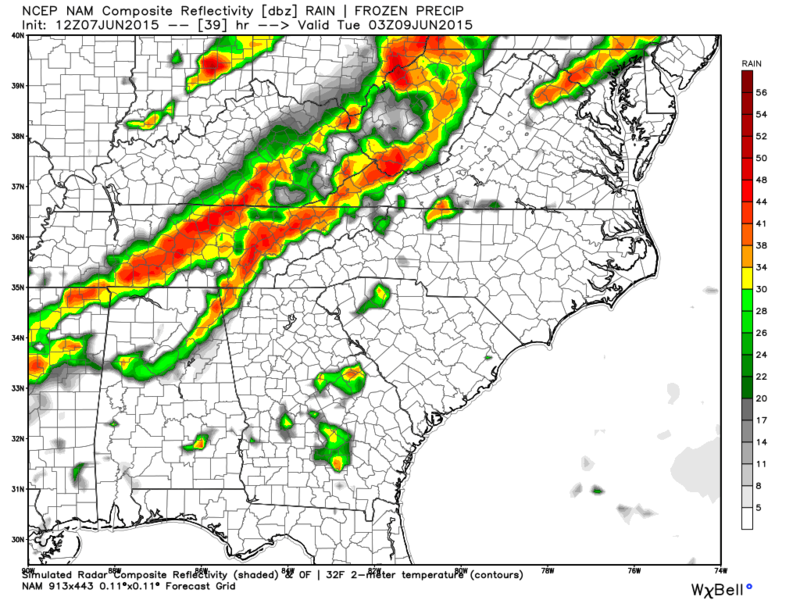 NAM model showing scattered t-storms during the afternoon and evening hours, ahead of an advancing squall line. Round 2 will come late in the evening and possibly in the early morning hours. 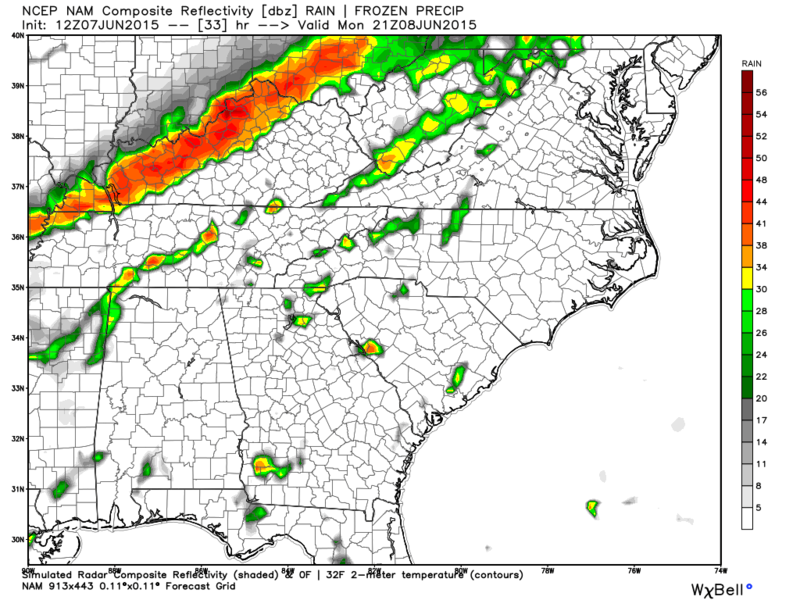 Models predict a squall line of strong to severe thunderstorms advancing southeast from eastern Kentucky to Tennessee and southwest Virginia. This line of storms will likely be stronger than the earlier scattered storms. Along with large hail, damaging winds, and heavy rainfall, isolated tornadoes are also possible, although the overall tornado threat is low. NAM showing the squall line impacting the region late in the evening and in early morning. 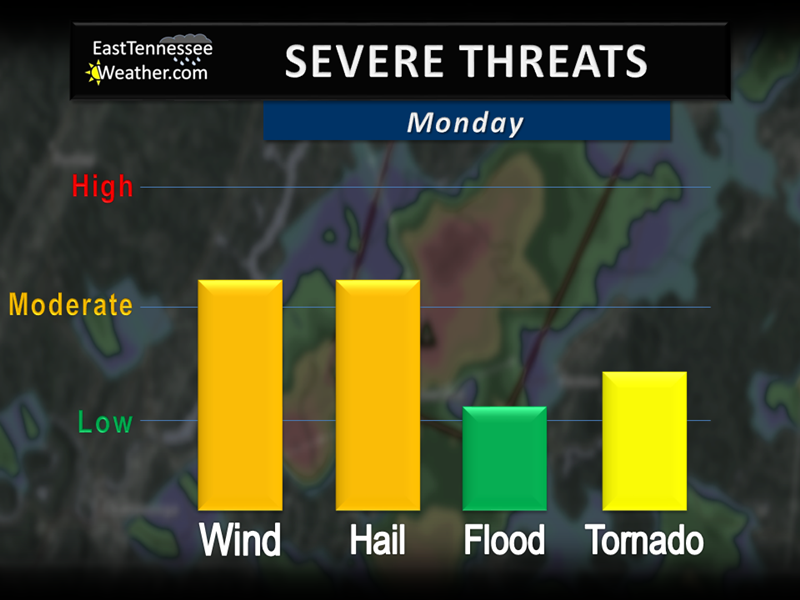 Severe weather is possible across all of East Tennessee on Monday. However, locations in Northeast Tennessee and near the TN/KY border will see the greatest risk. The Storm Prediction Center has included Northeast Tennessee, the Central Valley, and northern Plateau under a “Slight Risk” for severe thunderstorms. This includes the Tri-Cities, Knoxville, Oak Ridge, Morristown, La Follete, Onedia, and Crossville. “Slight Risk” (yellow) for a large part of the region. The “Slight Risk” also includes parts of Middle and West Tennessee and extends north into Kentucky, southern Ohio, southwest Virginia, West Virginia, western Maryland, and southern Pennsylvania. All modes of severe weather are possible, but the primary threats are damaging winds in excess of 60 mph and large hail over an inch in diameter. Overall, the tornado threat is low, but isolated tornadoes cannot ruled out. Some storms will likely deliver heavy rainfall which may result in flash flooding. Since the first update yesterday, models have been pretty consistent with their forecasts. Thus, our confidence in the severe threat has increased. Even so, there’s still a bit of uncertainty, especially regarding the first round of storms in the afternoon and evening and how they will affect the strength of the later squall line. If the first round of storms leave a lot of cloud cover in their wake or are more widespread than expected, it will likely inhibit destabilization of the atmosphere. This may lessen the impact of the squall line. Models have been a little wishy washy with the strength and coverage of the first round.